Lots of people ask me lots of questions when I’m driving them to their destinations. 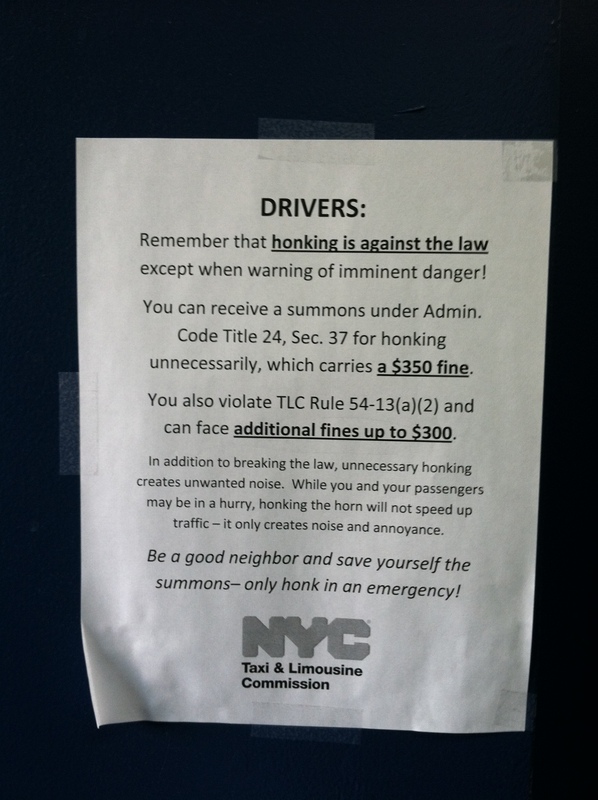 Sure enough, the honking ordinance always seems to come up. I haven’t ever seen anyone get a ticket for it but ask anyone trying to cross a busy Midtown Street at rush hour what he or she hears the most and odds are, it will be the chaotic din of car horns drowning each other out. Like any big city, New York has so many rules and regulations that it’s almost impossible to keep track of them all, even though all drivers (in theory) review the TLC rule book during their time in Taxi School. Quick, guess what the speed limit on a street is? Yup, it’s 30. What must you do if you see a disabled vehicle or someone pulled over on the right lane/shoulder of a highway? Move over to the left and give at least one lane’s worth of cushion as you drive by. Wipers on? Better have your lights on as well, but that always fell under the “Don’t swing on 3-0” type of rule that’s unwritten. Here in New Jersey, “Keep right, pass left” is posted on every major highway as well but let’s face it, do the State Troopers really have time to enforce that one? Without a doubt, the biggest pet peeve that this cabdriver has when it comes to traffic rules being blatantly disregarded has to be “No turn on red”. 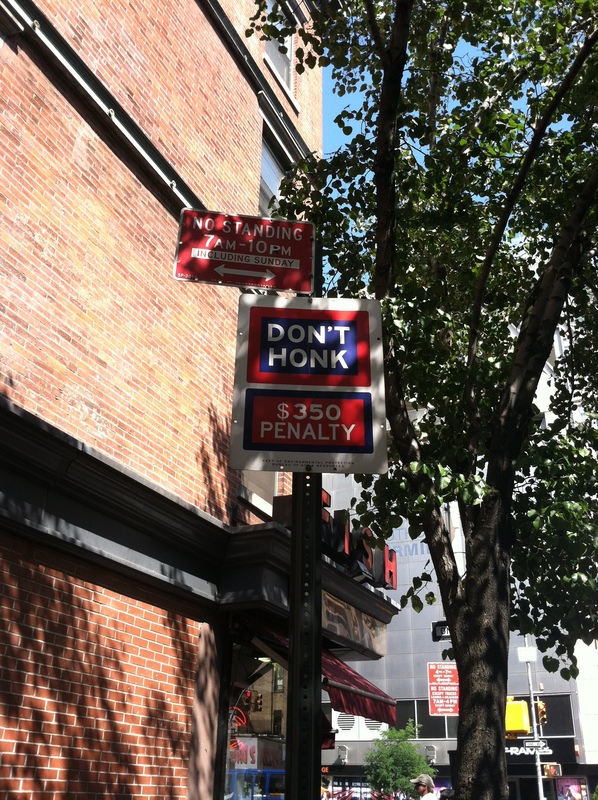 In most of America, it’s legal unless a sign is posted at a particular intersection. Of course, that is not the case in the 5 boroughs. One of the first signs you see upon entering the City after the obligatory “Welcome to New York” sign that has the Mayor and Borough President’s name is the sign stating that right turns on red are completely, totally illegal on city streets. Violating that law and getting nailed for it is the equivalent of running a red light. Since last weekend was a holiday, lots of funny-looking license plates were floating around the city as I ensured that the throng of tourists, overtime workers, and fleet week sailors made their way around during the 3-day holiday. Along with seeing 3 red lights run and a minivan going the wrong way down the middle of 10 Ave over in Hudson yards, there were tons of vehicles turning right on red after stopping. This is the same as standing in Times Square with the subway map totally unfurled as your fanny pack-clad family members crowd around and attempt to figure out the labyrinthine routes while waiting in line for a table at a Riese Restaurant to open up. It’s a dead ringer that you’ve not from around these parts and when I see people tap my window to remind me that “your light isn’t working”, I know that they didn’t bother to brush up on the lay of the land. My passengers and I always get a kick out of that, even when they’re from out of town too and understand how the Taxis in the city operate. Going back to the horns, it’s almost impossible *not* to honk over the course of a shift. I had one car a few months back that worked fine from top to bottom but the horn fuse was broken the entire time. Was I frustrated? Yes. Flashing my high beams to the Taxi or Livery vehicle in front of me that was dozing off at 3 in the morning just wasn’t the same and every time someone cut around me without a signal or dropped someone off in the most random of spots without using any flashers, I pressed down on the steering wheel where the horn would be. It’s all I could do to take my frustrations out. Horn honking isn’t a right but it’s something that’s just as ingrained as making late-night food runs or getting in line to wait for someone to come out of work or a nighttime establishment when the streets turn to airport runways. Us drivers have our own odd subculture that I didn’t pick up on until I got behind the wheel of a yellow vehicle for 50 or 60 hours a week. Like anything else, there was a quick adjustment period but some of the customs that once seemed odd to be are now as routine as my 7 A.M. dinner or “pre-game” ritual of cleaning my vehicle out before I hit the road every evening. Now if you’ll excuse me, I need to blow my horn. You’re in the way of my next fare!